The SuperKrobs a special card. 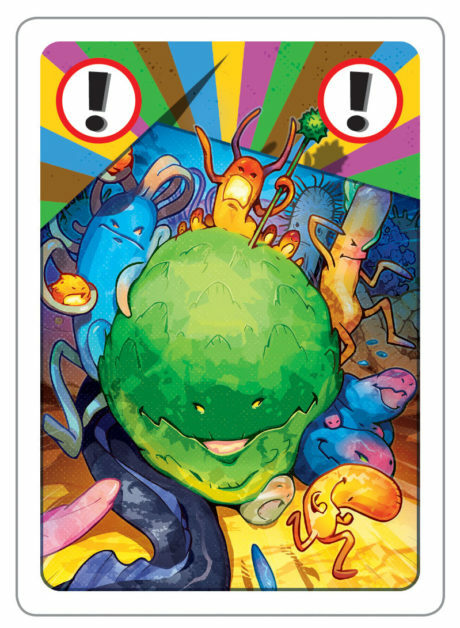 It is multicolored, which allows the « super » germ to attack all the players undergoing a risky activity independently of the color of the card. The SuperKrobs was added to the game to increase the number of attacks and therefore the number of illnesses. Getting sick promotes retaining the messages of prevention by showing how one can get exposed to germs and how severe the disease can be. In real life there are no super germs like SuperKrobs that can be transmitted by any activity. However, the human immunodeficiency virus (HIV) causes a severe reduction in the protective activity of the immune system, which allows so-called opportunistic pathogens to attack us. Opportunistic germs are not dangerous for healthy individuals, but become so when the immune system is weakened. Other situations where we can find a weakened immune system are, pregnancy, organ transplantation, or during chemotherapy for cancer treatment. You can visualize SuperKrobs as something that weakens our immune system and puts us at risk for all germs.